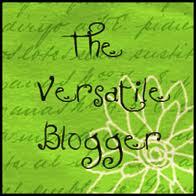 Would like To be a Yummy Mummy awarded me the Versatile Blogger Award. Thanks so much. I love Karen's blog. There is something very girly and neat & tidy about it - always a pleasure to visit. Definitely one of my favourites. I am a Yoga Teacher. Taught till I was 36 weeks pregnant and haven't since. I wear my heart firmly on my sleeve. I once got sick on my boss (drink induced) Summer 2007. I've been to Magaluf (spelling?) - it was awful. The first VHS video I owned was Dirty Dancing. I can't lie to save my life!